Have I ever met a day that’s not good enough for snorkeling? NO! If you’ve been following us for a while then you know we hardly skip a snorkel-tunity, and we have a strict family policy of ‘first in the water, last out’ when snorkeling with a group. 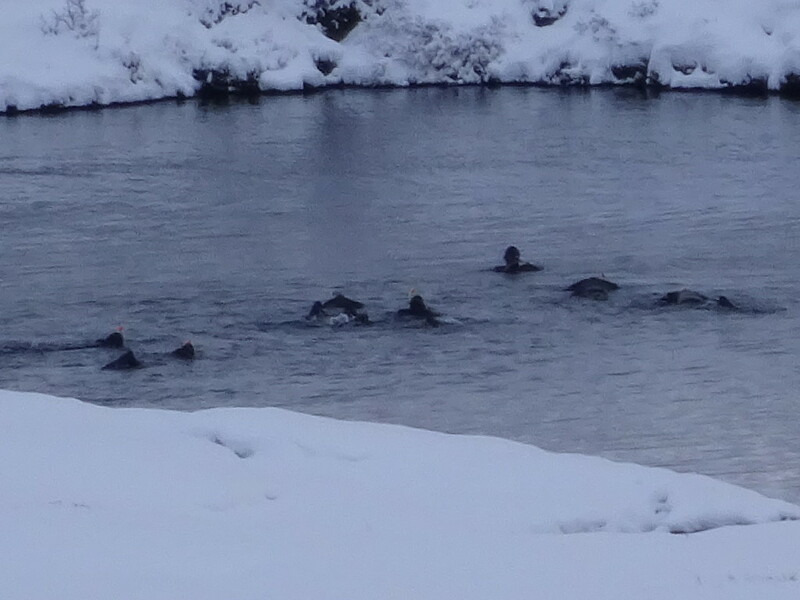 So you might understand our excitement when we learned about snorkeling in… Iceland… in January. It wasn’t even a discussion point. We both leaned over the tablet peering at photos, glanced up at each other, and Aaron reached for the credit card. Heck yeah, we’re going! Perfectly good snorkel day! 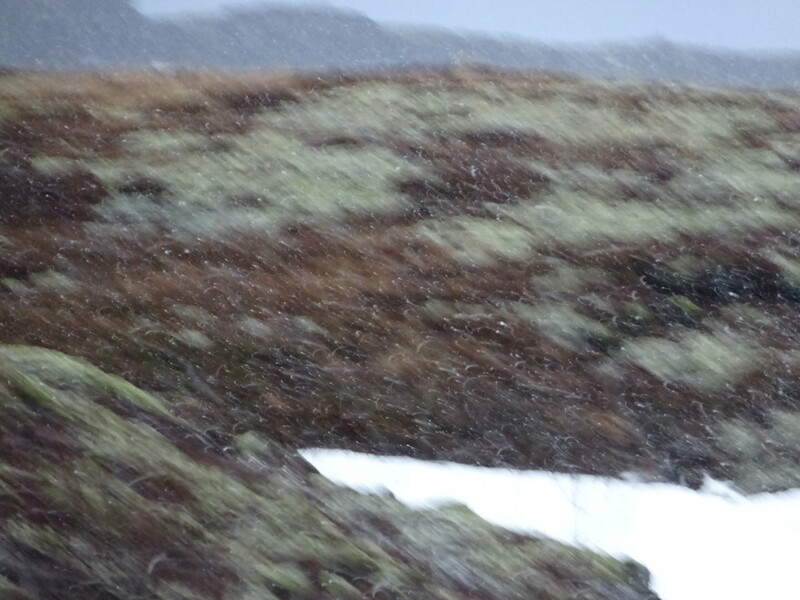 Yeah, that’s snow. 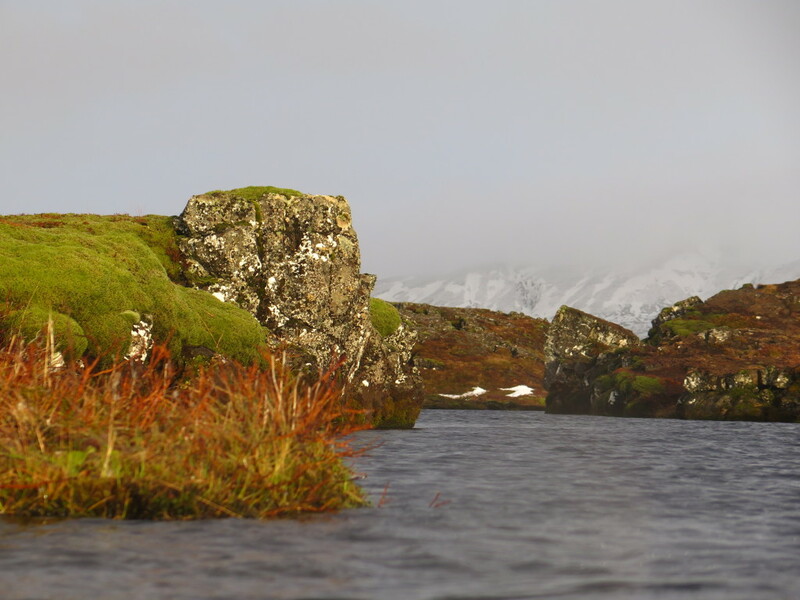 We found out that Iceland lies over some of the world’s main tectonic plates. There are a few places on land and a few places below water where you can actually see the Eurasia tectonic plate rubbing up alongside the North American plate. 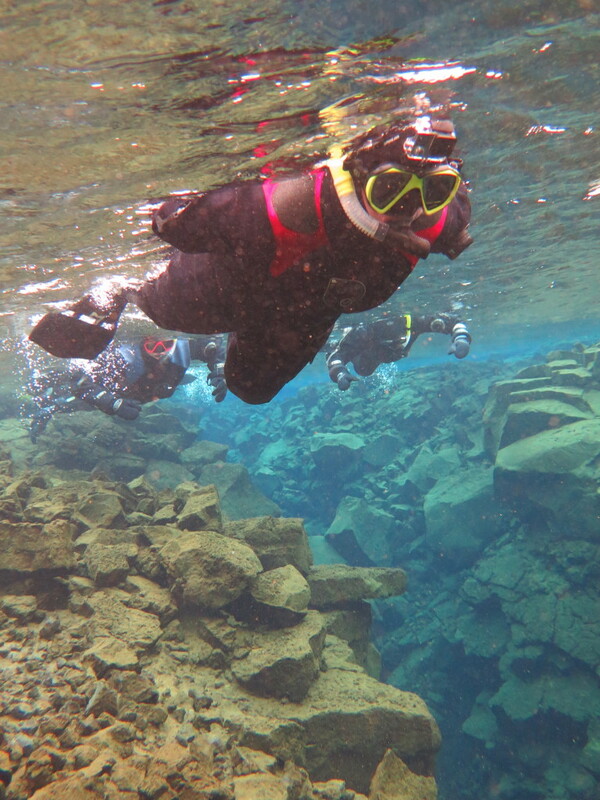 Iceland is one of those places and in Thingvillir National Park you can snorkel right between them. Unreal! Just look at it! One seriously beautiful place. Sure, the water was about 35 degrees Fahrenheit and there were snow squalls as we suited up in our drysuits, but we were going to see it for ourselves! 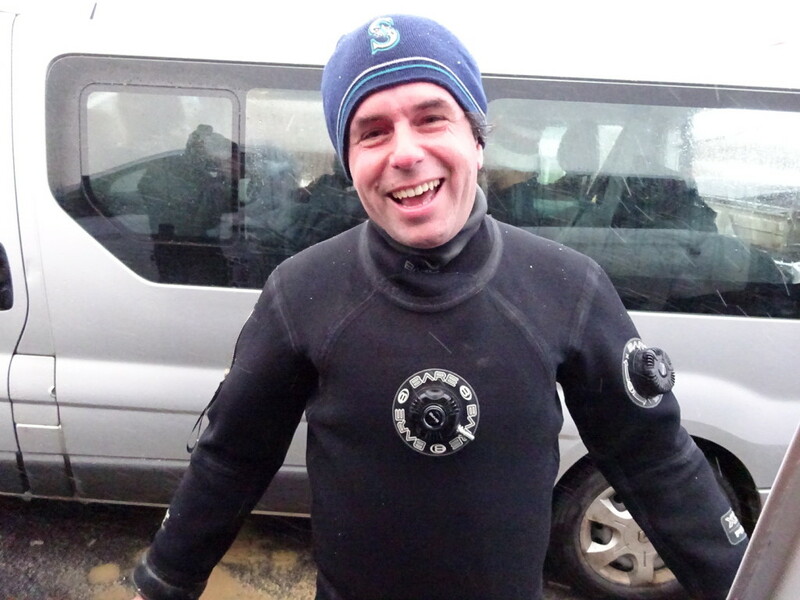 Aaron rocking the drysuit in Layer #2 or 3 of what felt like 5,000. We went with Dive.is, a company with good reviews on TripAdvisor. They picked us up right from our hostel, which was quite nice. Iceland is REALLY set up for tourists that way. Anyway, our driver / snorkel guide was also a world traveler having been on the road for four years before heading back to Iceland. Impressive!! He was our kind of people. 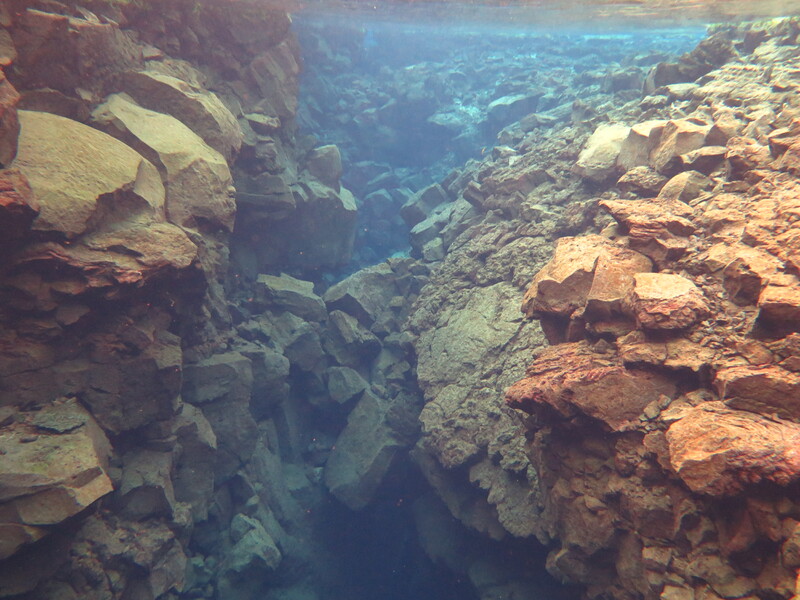 We drove to a place called Silfra, about 45 minutes from Reykjavik. 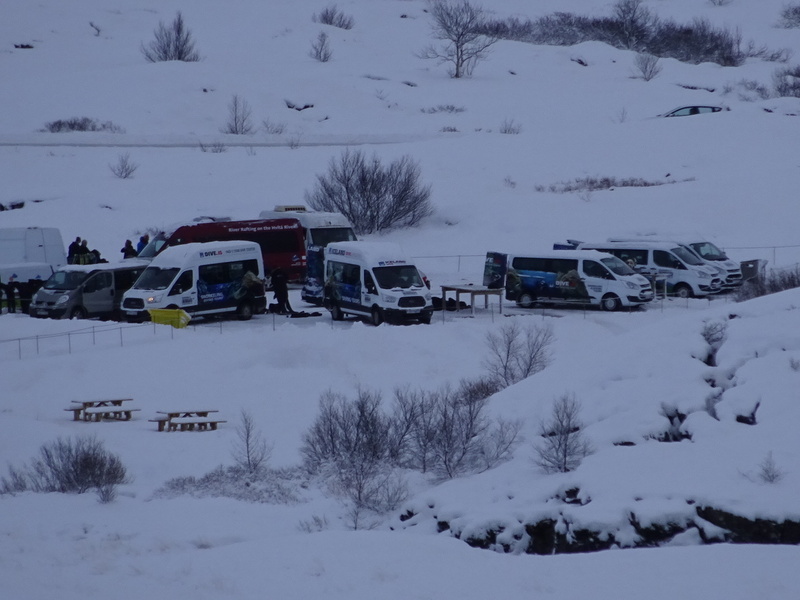 Gotta say, all the snorkel and dive groups seemed very organized (there were about four leading tours while we were there) and, like everyone in Iceland, all the guides were incredibly helpful. All the dive and snorkel vans park and everyone gears up. You can see this is a pretty popular activity. There’s a big table to set stuff on and a rather nice (albeit, chilly) bathroom nearby. 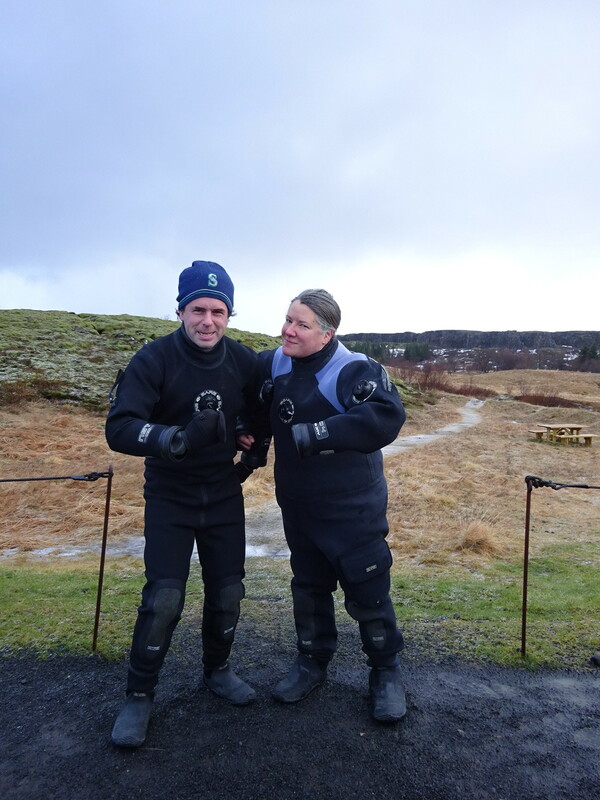 Two layers on – my own woolies and the company-provided insulated longjohn suit. Bring on the drysuit! The worst thing was suiting up. It took a looong time to get all the layers on. Our guide claims to have a future as a pre-school assistant because he’s really skilled at getting people dressed. Trust me, I felt like a toddler waddling around in my 4,000 layers. 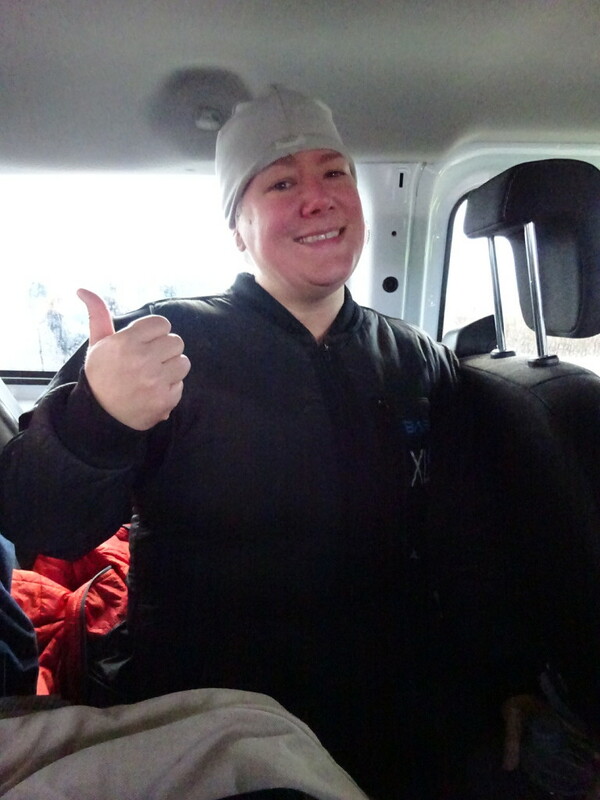 We dressed some in the van and more out in the squalls so everyone got pretty cold before we even got in the water. I didn’t feel too bad, but Aaron looked so cold and miserable. The wind made tears in the cracks of his eyes and he was shivery. That just made me sad! No one wants to see their Honey suffering, but he’s strong and kept his normal sunny disposition. 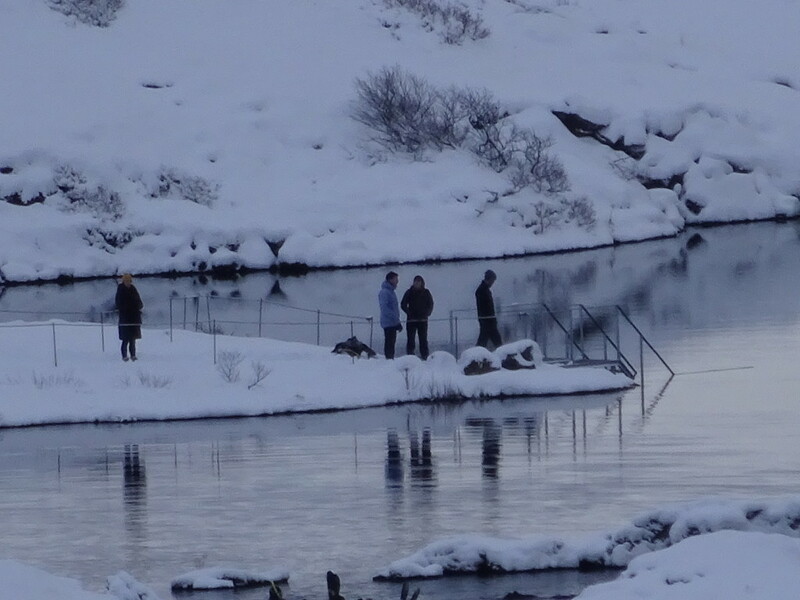 Finally we waddled over to the lake and descended stairs into the frosty waters. In ya go! This is not us, but it’s exactly what we did the day before. Can I just say that getting in was not too bad! Even Aaron agreed. Honestly, I thought the Barfing in Bali day was much worse than this. The water was freezing on our faces and hands, but the rest of us really did stay warm and dry as we floated like beach balls while the current pushed us along. Below us the two continents met. Man, science is cool! Asia on my left and North America on my right. When do you get to see something like that! In the back I’m on the left in the red mask and Aaron’s on the right wearing a blue bracelet our nephew Michael gave him a few years ago. He wanted to make sure Michael knew that the bracelet went on all our adventures with us. 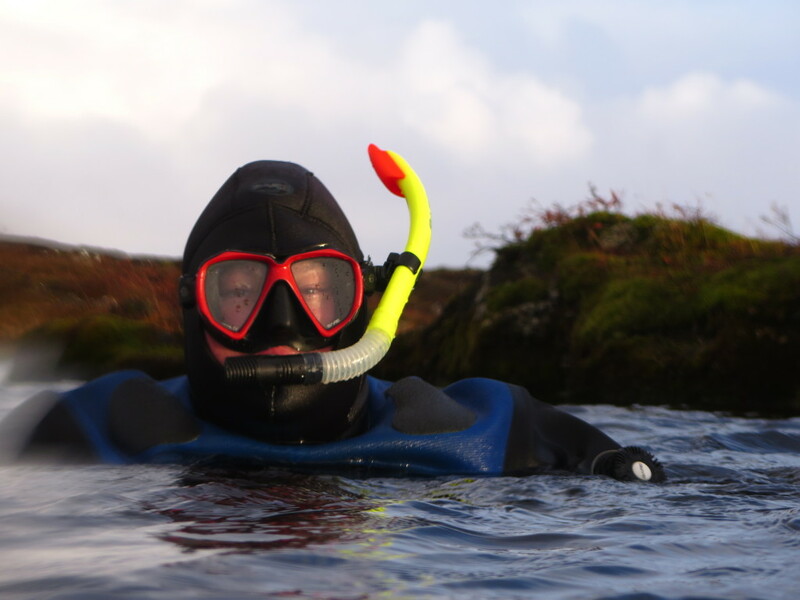 Visibility in Silfra is pretty impressive! 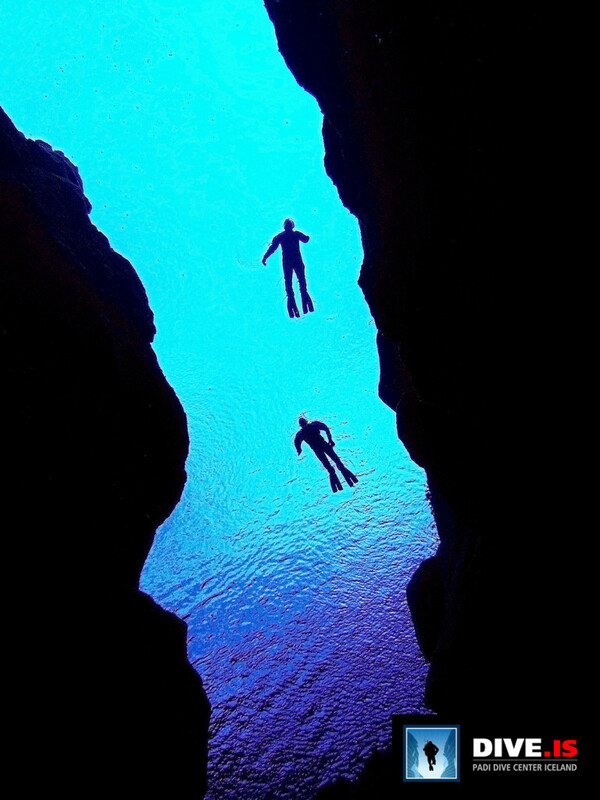 Let’s swim between the continents, shall we? Crazy! The time flew and just like that our 35 minutes in the chiller was over. They have the exit spot all set up with platforms and it was very easy getting out, even with frozen hands and faces. Not like trying to crawl into a boat. Then we waddled back to get dressed in our regular clothes, eat cookies and drink hot chocolate to warm up. Aaron only ate cookies. That’s my guy! On the way home I felt chilled and couldn’t put my finger on it. The van was warm, I had food, I should be toasty. It wasn’t until I got home that I realized my hair was soaking wet. Well, that would do it, eh!? A warm shower and a hair dryer fixed that situation nicely. Aaron, on the other hand, caught a fever. Not at all sure it was a result of the snorkeling as he had been a little “off” for a few days, but maybe it put him over the edge. He spent the next two days in bed. Happy to report that was all he needed and he was still pleased he did the snorkel. Just for fun, here’s a few shots from the Dive.Is folks – I think from the colors these were taken in summer. Us? We feel mighty proud of our winter experience! 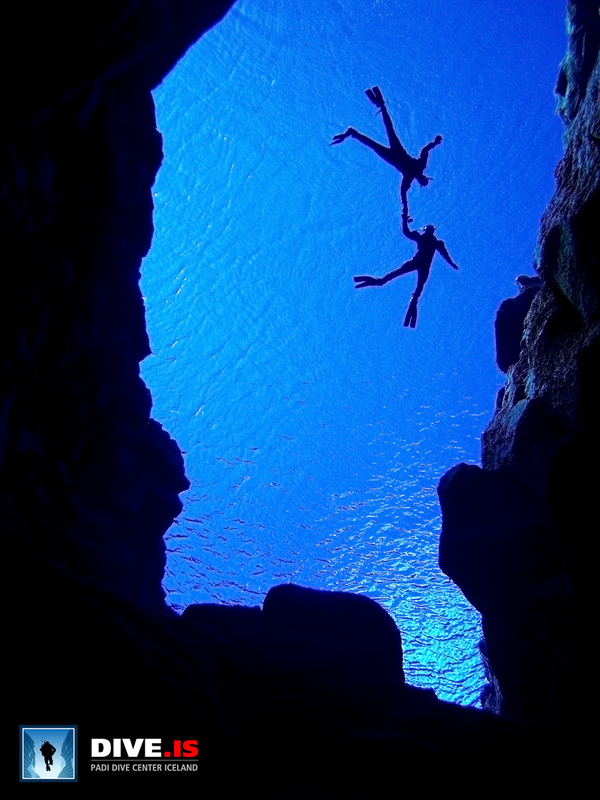 Folks dive as well as snorkel and these are taken from down below. Really does feel like you are between two continents! Join us in a few days and we’ll take you on the Golden Circle! I’m so glad you did this (so now I don’t have to). Lol. Looked pretty amazing though. Says the woman who did the polar plunge in Antarctica!